Here at Pro-Lite, we take cycling equipment very seriously. And as more and more people are finding out, it shows in the quality of our products. Now there are plenty of riders out there that hammer on their equipment pretty hard, but when it comes to putting severe stress on a components in the field, there are few proving grounds as demanding as the world of Tandem racing. There isn't much that compares to the forces that a wheel has to bear when carrying two full grown men through a corner at speeds that can approach or even pass 100 km/h. You know it's pushing the limits of equipment when you can apply the front brake and get skid marks on your down tube. But it's more than that. Tandem is a fascinating part of the great sport of cycling that requires some pretty specialized skills and some really serious teamwork. It's a combination of some of the most challenging aspects of competition as well as some of the most rewarding. So there are a couple of guys off in Holland making the news all over the place on Pro-Lite wheels, so we thought we would take a bit of time and ask them some questions. English is not their mother tongue, so we really appreciate them taking the time and effort to answer as quickly as they did. Enjoy! PL: Thanks for your time guys, first off, for those who aren't familiar with the world of Tandem racing, we would like to get to know you a bit. Who are you guys? What kind of work do you do? R: I'm a visually impaired guy from the Netherlands. My 2 brothers got their own company (www.bonhof.com) where I do all kinds of jobs which I can still do with my eyesight. It’s mainly computerwork since this is the best option for me. J: I’m Jeroen Lute, 28 years. I started riding tandem with Richard 3 years ago. Besides that I’m also riding my soloraces and win a couple times a year a race solo. Besides cycling I’m working full time as a civil engineer. PL: How long have you guys been racing? Have you guys always done Tandem? R: I started riding a tandem in 2002 after I got in contact with "Mister Tandem" Jan Mulder. Mister Tandem was THE tandemrider of the Netherlands, Europe and the World. 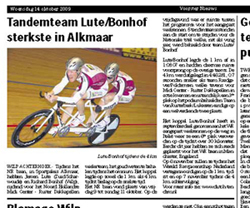 Jeroen and I started racing together on the tandem in 2007. Since then everything went fast- we have been riding several National races, timetrials, World Cup races and World Championships on the track and road with good results. J: I’m started racing on my 12th. 3 years ago I met Richard and that’s when we started riding the tandem. PL: What got you interested in Tandem? R: For me the tandem is a good opportunity to do sport since I can’t ride races on my own. The speed and teamwork on the tandem is great which makes it so interesting. J: By accident Richard asked me to be his pilot. Since the moment I got on his tandem it “clicked”. The past 3 racing seasons we had we achieved several good results like the National Championships, podium during World Cup races and 6th during the WC timetrial in 2009. PL: A lot of riders have never had a chance to ride or race on a Tandem. What is it like? How is it different from riding, or more specifically, racing a single? R: I have never been racing single so Jeroen should answer this part. Riding a tandem seems so easy and that’s what we always get to hear as well. People always seem to think, 2 riders, twice the power. This is not the case. The average speed might be a bit higher but for the rest it’s as hard (or easy) as a solo bike. Going uphill is a lot harder with a tandem, going downhill is just super. J: The principle of the tandem is the same. The harder you push the pedals, the faster you go.But, on the tandem you have to do it together so there has to be a certain cadence. As a pilot you should try to move as little as possible. Richard feels every move I make on the tandem which makes it harder to ride the tandem. Especially in a sprint you have to keep the bike straight otherwise Richard will be thrown of the bike.If I get on my solobike again after a trainingcamp it’s really strange. It seems my bike wants to go all directions since I got no more weight behind me. A lot of people think that you are able to go a lot faster on the tandem instead of a solobike.The past months we did several timetrials between solobikes. A couple times we didn’t win because riding the tandem is harder in curves etc. It puts more pressure on the frontwheel and the pilot’s power goes indirect to the rearwheel. PL: With two riders, it's easy to imagine how there are much greater demands on equipment to handle more weight, more speed and more power. For the equipment, every stress is basically doubled. From your experience, what kind of special demands does Tandem racing have on the equipment? What do you look for when you outfit your ride? J: The tandem has to be a lot stronger then a solo bike. Because of pushing on the pedals together you produce a lot more torque on the frame. This is why the parts on the bike have to be a better quality then on a solobike so you can’t safe to much on the weight of the tandem.De fiets moet veel sterker zijn als een normale solo fiets. Doordat je met zijn tweeën op de pedalen sta te drukken, ontstaat er ook veel meer torsie in het frame. De spullen op de tandem moeten hierdoor van een betere kwaliteit zijn als op een solofiets, dus op gewicht kan je niet heel veel besparen. PL: I notice that you use a different wheel for the front as the back. Of course, this is pretty common even for singles, but why did you choose those specific wheels? Why do you feel the Vicenza works best for your front wheel? R: We have never been using a discwheel up front. Since we also use the Vicenza for timetrials on the road with strong winds, we prefer this wheel instead of a discwheel up front. J: For timetrials and trackraces we were looking for “fast wheels”.My team, Ruiter Dakkapellen, has used Pro Lite wheels in 2009 as well and they were very content with it, that’s why we started using them as well.We are very happy with the Pro Lite wheels, they are stiff, strong and also good-looking. PL: And what can you tell us about your experience with the Padova Disc wheel in the back? R: We have tried several discwheels on the tandem in the rear. Some of them were just simply too weak and started to “wabble”. The Padova is very stiff and strong which is really important, especially on the track. The great thing about the Padova is also the changeable axle. For timetrials on the road we can use the same wheels after just chaning the axle. J: The Padova is super!! It’s a stiff and strong wheel. PL: Well, thanks for your insights guys. All the best as you carry on tearing it up on the Tandem circuit!